This upcoming Wednesday marks the most important annual event in Canadian politics; the introduction of the budget. At the moment the Canadian economy is faring well: it is expected to grow 2.4% in 2017, the jobless rate has returned to pre-recession lows, and the price of oil has risen to $50/barrel, $10 away from the threshold needed for Alberta to produce oil profitably. The budget is expected to be relatively modest, a precursor to what is anticipated to be a more substantive fall economic update. The highlights in next week’s budget are likely to be significant infrastructure investment, a new innovation initiative, and a tax credit review. The innovation program comes as Canadians are seeing wages rise slowly however, with uncertainty south of the border, the tax credit review is unlikely to result in major changes to the current regimes. Finally, the government may choose to address skyrocketing real estate prices in the country’s largest cities which is attracting considerable foreign investment. The official opposition has stated that the Conservatives would like to see no new tax increases, no policies that will increase costs to seniors, and a plan to balance the budget in the future. As for the NDP, Canada’s third party would like to see the closure of tax loopholes benefiting the rich, and actions taken to improve the status of first nations communities. This mirrors the topic of the first debate in the party’s leadership race, a considerable portion of which was devoted to inequality in the Canadian economy. Conservative leadership hopefuls have advocated for lower income tax rates, and frontrunner Maxime Bernier would like to further cut corporate welfare. Michael Chong on the other hand has proposed a carbon tax to make up the difference in cuts to income tax. The general consensus, however, is that the whatever the fiscal choices the government makes, it is a budget that will be designed to bide time before making radical change. The Trudeau administration likely preferring instead to wait and see what happens south of the border. While the Canadian economy is likely to benefit from a bolstered US economy, it is unclear what a ‘Trumped Up’ NAFTA will look like. Canada is the chief destination of exports for 35 of 50 states and it would be foolish on the part of the United States to underestimate the importance of the relationship it enjoys with Canada. That being said Canada should be prepared to stand up to the administration if its demands are too extreme. While NAFTA has made a positive impact on the lives of Canadians (and Americans), no agreement is better than an unfavourable agreement. Importantly, the demise of NAFTA does not mean an end to US-Canadian trade. Even with the American withdrawal from the TPP, Canada has broadened its traditional free trade horizons participating in new trade agreements. 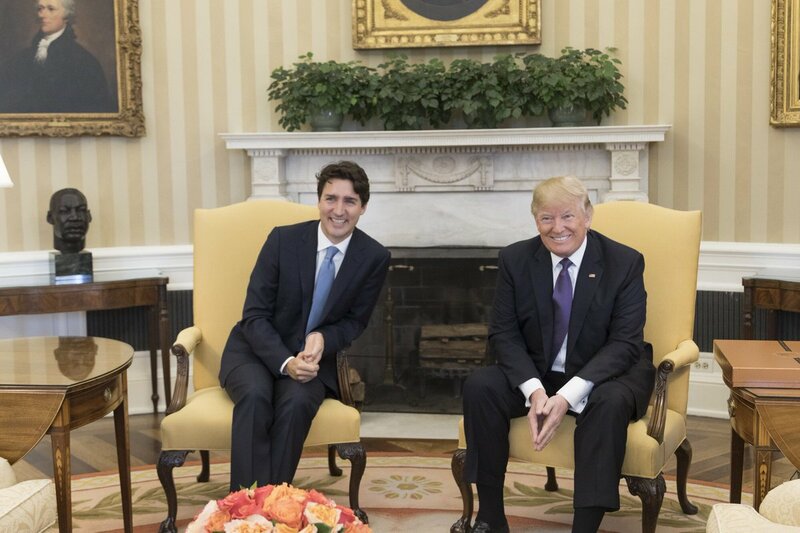 Canada’s signing of the Comprehensive Economic and Trade Agreement between Canada and the European Union (CETA), highlights that Canada need not abandon free trade should the US adopt more protectionist policies. The budget comes as Trudeau is enjoying increased popularity, and the economy is showing promising, albeit preliminary, signs of recovery. As a result the government will likely introduce a prudent budget, hoping not to upset these positive signs as they bide their time to see what these tumultuous times may bring. [footnote]David Cochrane and Karina Roman, “Bill Morneau planning cautious budget for March 22 as he waits on Trump,” CBC News, March 7, 2017, accessed March 14, 2017. The Globe and Mail, “With 2017 federal budget date set, Liberals keep one eye on Trump,” The Globe and Mail, March 8, 2017, accessed March 14, 2017. Theophilos Argitis, “How Prime Minister Trudeau fares in a pre-budget scorecard: Canada economy watch,” Financial Post, March 13, 2017, accessed March 14, 2017. Erica Alini, “How the 2017 federal budget could affect your wallet,” Global News, March 10, 2017, accessed March 14, 2017. David Cochrane and Karina Roman, “Bill Morneau planning cautious budget for March 22 as he waits on Trump,” CBC News, March 7, 2017, accessed March 14, 2017. Elizabeth Thompson, “Jobs, pipelines dominate NDP debate as 4 leadership contenders square off for 1st time,” CBC News, March 12, 2017, accessed March 14, 2017. Andrew Coyne, “Tory leadership race reviving interest in cutting income taxes — and it’s about time,” National Post, March 6, 2017, accessed March 14, 2017. Andrew Coyne, “If Donald Trump gives up on free trade, Canada doesn’t have to follow,” National Post, March 10, 2017, accessed March 14, 2017. The Canadian Press, “Canada-EU trade deal at a glance,” The Toronto Star, February 15, 2017, accessed March 15, 2017. Nanos, “Nanos Weekly Tracking,” Nanos Research, March 14, 2017, accessed March 15, 2017. David Paddon, “Canadian economy to grow by 2.4% in 2017 to match U.S., OECD predicts,” The Toronto Star, March 7, 2017, , accessed March 16, 2017.